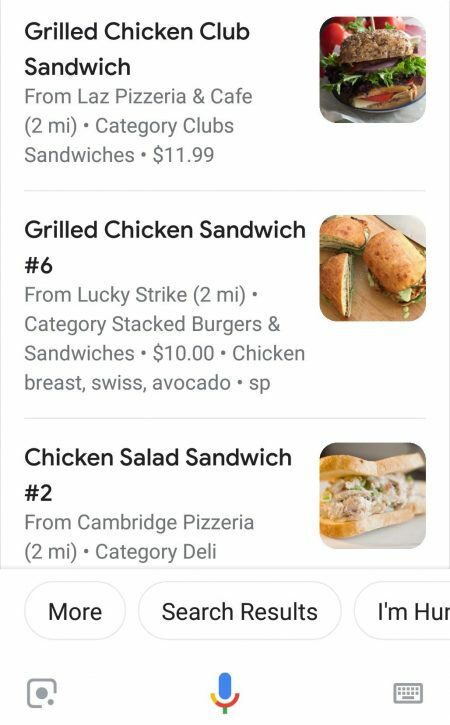 We’re excited to announce the release of Orderscape Marketplace V1.0, the first nationwide food search action for Google Assistant. The Marketplace helps you quickly find food you’re hungry for at over 50,000 restaurants (and growing) using your voice. It’s available anytime via on your smartphone and other supported devices including Google Home Hub, Android TV, Wear OS devices and Chromebook. We’d love for you to give it a spin and tell us what you think. And Full Menu Voice Ordering is coming this summer… Stay tuned! Now you can actually find specific menu items near you, not just restaurants whose menus you have to open laboriously to find what you want, saving you minutes to hours. Who knows, you might even discover a diamond in the rough. Now you have the power to use your voice naturally to search for thousands of menu items nearby before considering where to order. Don’t settle for just getting a list of restaurants to then have to search each menu individually. Don’t waste time. See and hear available menu items from restaurants in your neighborhood to compare and contrast before deciding where to order. Now restaurants have even more exposure to customers by joining Orderscape’s Marketplace in the exploding voice industry. Getting seen is free—just ask us to include your online locations and menus in our search index.